Julie Martini is a visual artist in Boston, MA. 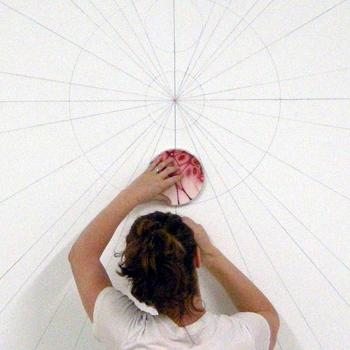 In her work she explores the relationship between science, nature, and the sacred. In her most recent projects, she responds to the macro and micro patterns that create the basic building units in nature and spiritual architecture. She earned her Bachelor’s in Studio Art at Carleton College and her Master’s degree in Fine Arts at the Massachusetts College of Art & Design. Julie’s work has been featured in numerous exhibits, including Feelers at the Boston Center for the Arts’ Mills Gallery (scheduled), a 2015 Solo Show at D.E. Shaw, New York, NY (Curated by Uprise Art), the Walter Feldman Fellowship Finalist Exhibit at the Walter Feldman Gallery, Boston, the Design Science Symposium at the Rhode Island School of Design, and “Flourish” at Massachusetts College of Art and Design. She has received residencies at I-Park, the Petrified National Forest, the Women’s Studio Workshop, and the Vermont Studio Center.